I posted this article on Giovanni’s World, where I once served as its honorary (i.e., unpaid) “West coast editor.” I’m re-posting it here because this needs to get to as many people as possible. We just received a comment from Lance Corporal Jeffrey De Young: Both he and Cena, “the shortest marine,” have been injured. Please pray for them! His comment follows the news article. UPDATE: For Jeff and Cena pics, CLICK HERE. FORWARD OPERATING BASE HASSANABAD, AFGHANISTAN — He’s the most happy-go-lucky Marine in Golf Company, the shortest and the most likely to eat dead mice. Cena, an easygoing two-and-a-half-year-old black Labrador retriever, is the unit’s IDD: IED Detection Dog. He’s trained to sniff out the homemade bombs — the military calls them improvised explosive devices — that insurgents have planted all over the roads, fields and paths where the Marines patrol on foot. Patrols sometimes look like one big frolic for Cena, who likes his job. It is, after all, not much different from being walked. 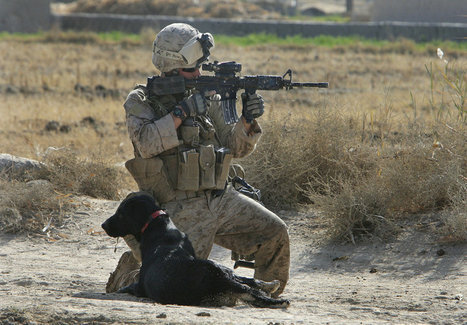 He lopes around, sniffing paths and piles of hay and corn shucks, wagging his tail and usually — but not always — obeying the command of his boyish handler, Lance Cpl. Jeffrey De Young, 19, of Holland, Mich.
De Young got five weeks of training before Cena and he deployed from Camp Lejeune, N.C., a few weeks ago. Cena had been in training since he was 7 weeks old. On patrols, which can last two or three days, De Young carries not only his own food and water but also enough for Cena, as well as a small kit of veterinary supplies in case the valuable dog get sick or hurt. Cena’s role is to save lives by finding bombs — he’s found one big one buried in a road and another hidden, ready for burying — but he’s also a morale booster. Whenever De Young lets him loose in camp, the dog ambles around looking for someone to scratch him behind his ears. The job is a serious one, and the Marines, who are sometimes prone to dark humor, have nicknamed the solidly built Cena “Pressure Plate,” after a type of detonator that’s used on weight-triggered bombs. They figure he’s just heavy enough to set one off. Hey guys, me again. Just checking in. Cena recieved some stitches when I was hunting for IEDs. Me and him both were hurt, but it hurt me most to see my brother (Cena) needing help. Please pray for him and contact my mom through here if you want my address. A lot of my fellow Marines need olive drab shirts and socks. It’s a lot to ask for but any help would definitely be much appreciated. And to my mother …. I’m sorry I didn’t tell you I got hurt as well. It’s tough over here and I didn’t wanna worry you. I love you mom and I’ll be just fine. Every day these marines put their lives on the line just like me, and they are my brothers. When all else fails, we have each other. UPDATE: Please go HERE for LCpl De Young’s mailing address to send your care package! Thank you. forget, my guardian angel will include them for me. FPO AE 09510 3080 ..
My heartfelt thanks for all you do and your dog as well. I am a dog lover and so respect what you all do. Care package inbound. I love you and pray for you and Cena! I’m proud of the job you and all the others are doing. Be safe and come home to all of us soon. I want to thank you for being the best son and Marine a mom can have! Bo and Tess miss you and will love to meet Cena when you get home. Lindsey wants me to say Hi and she loves you too! God bless you and keep you safe! LCpl Deyoung, I hope you recall who I am, sounds like all the training has paid off. Looking forward to seeing you and Cena on your return trip. Keep em safe!! & Semper Fi. If you need anything from this end, let me know.